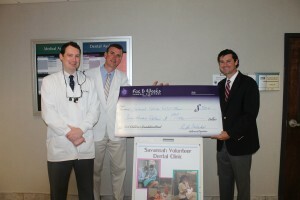 Fox & Weeks Funeral Directors was honored to present a York Children’s Foundation grant in the amount of $500 to the Savannah Volunteer Dental Clinic for Children in March. The Savannah Volunteer Dental Clinic for Children is a non-profit program utilizing a network of volunteers from Savannah’s dental community actively participating in the preventative and therapeutic oral health care of the Coastal Empire’s underserved, uninsured children. Founded in 2008 by Dr. Felix Maher, DMD, the clinic has grown to serve more than 550 children and has a volunteer staff of nine general dentists, six dental specialists, eight dental hygienists and six dental assistants. The clinic is partnered with Savannah Technical College, Armstrong State University and the Medical College of Georgia, and dental students, dental hygiene students and dental assisting students assist in the treatment of patients as part of the clinical rotations. Go to York Children’s Foundation to learn more about this incredible program!